William Waterway sits atop exposed foundation at Gay Head Cliff. 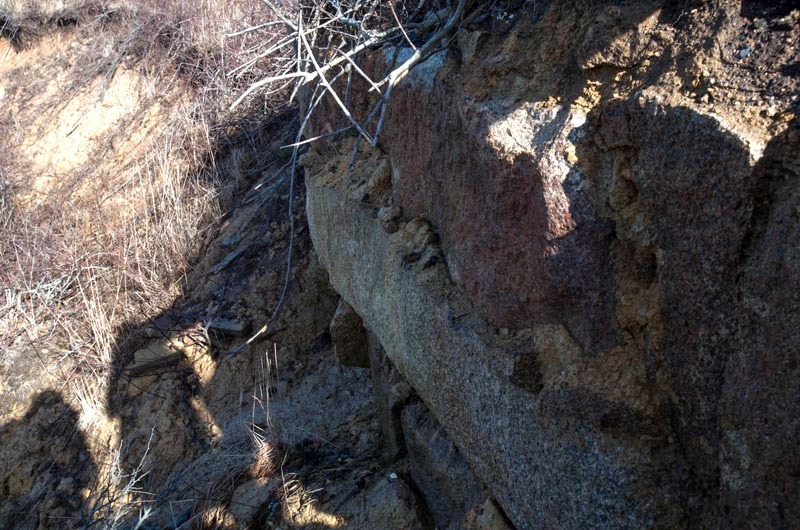 Heavy rains over the past few months have unearthed a layering of several granite stones at the edge of the cliff near the current Gay Head Lighthouse, sparking a series of hypotheses about its former use. The foundation’s position at the tip of Gay Head, as well as its substantial structure, suggests to some that it may have served as a base for the second of three versions of the Gay Head Light. According to records in the Dukes County Intelligencer, the Gay Head light was originally built in 1799 as a wooden structure, moved back 75 feet in 1844, and then rebuilt nearby as a brick structure by 1856. Local historian William Waterway first noticed the set of stones last summer and has been monitoring their subsequent protrusion over the cliff’s side. The stones appear to be several feet long and secured with mortar, though much of the stone mass may be concealed under the ground. 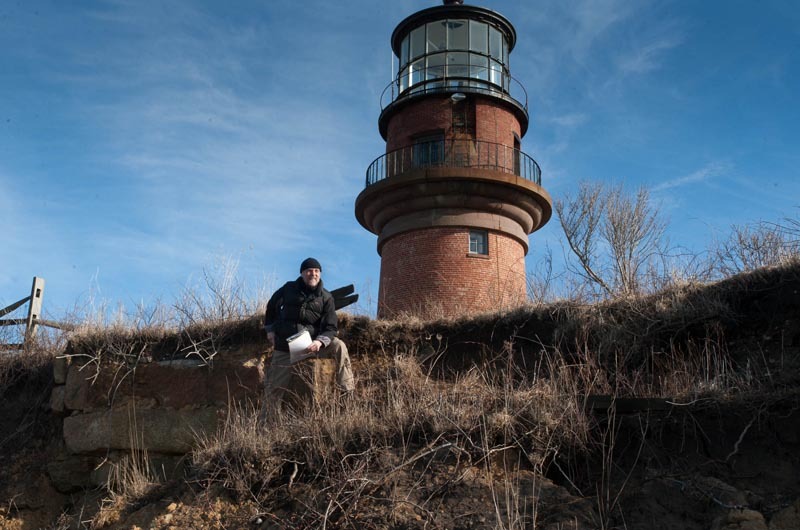 He has conducted extensive research into the written records of lighthouse relocations and construction plans, but says the most convincing evidence is the concrete. He consulted Wayne Wheeler, president of the United States Lighthouse Society, who offered some other possible uses for the foundation. These include a fortification from the revolutionary war, or the foundation for a colonial lighthouse keeper’s house, Mr. Wheeler said. Mr. Wheeler worked on the Vineyard in summers during the 1950’s and described the keeper’s house as having been located behind the lighthouse towards the public road. The keeper’s house was also originally built as a wooden structure in 1799 and stood next to the lighthouse. It was moved back in 1844 with the lighthouse and also rebuilt as a brick structure in 1856. The house was then rebuilt with wood in 1902 after lighthouse keepers and their families reported for many years of mysterious illnesses, which some attributed to the dampness of the brick structure. The house was eventually torn down in 1956, according to the Dukes County Intelligencer. For an accurate assessment of the exposed structure, Mr. Waterway would like to pursue an archeological dig at the site. While others agree that the preservation of the structure is important to reconstructing history, some worry that such a dig might further endanger the stability of the current lighthouse. Len Butler, chair of the Save the Gay Head Light relocation committee, said the foundation has been serving as a sort of revetment against further erosion of the land surrounding the current lighthouse. An archeological dig could compromise the ground underlying the lighthouse. “It is something we wouldn’t be able to do until we moved the lighthouse,” Mr. Butler said. The current Gay Head Light was recently named one of the 11 most endangered historic places. It stands less than 50 feet from the edge of the cliff and a campaign is underway to relocate the Light. The newly uncovered foundation, protruding precariously from the side of the cliff, is also in danger. “Once it goes over the edge, we will lose everything,” Mr. Waterway said.